February 14, 2013-Well, I really goofed up this time. (You’ll see how in a moment). 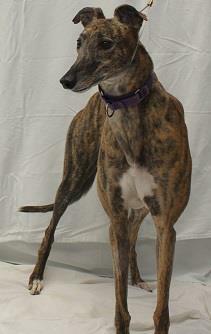 I am always looking for new ways to raise money for the greyhounds at our center. 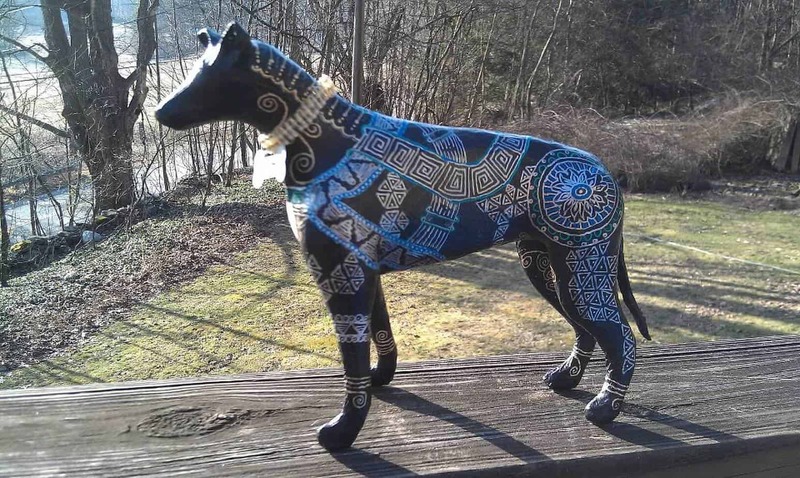 I had been looking for a way to create a “litter of pups” to auction off for Valentine’s Day after seeing another group that did an auction of crocheted greyhounds last year. 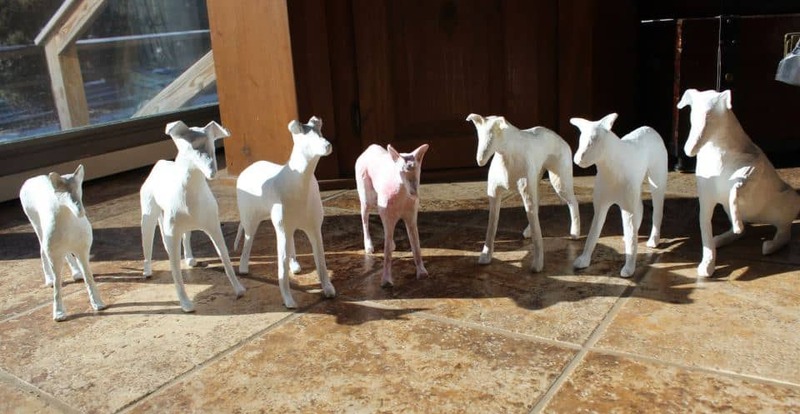 We had a table at a Christmas craft fair and a lady had a booth of paper mache animals. I hadn’t done paper mache since I was in grade school and we made pinatas but she kept telling me how easy it was so I decided to look into it. The first site I found was UltimatePapeMache.com. Jonni had created a series of 6 videos on how to make a paper mache cat. 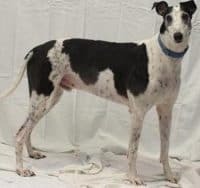 I watched them and thought I might be able to do that with the greyhounds if I got enough volunteers to help. So we decided to make nine and call them the Valentine Nine. 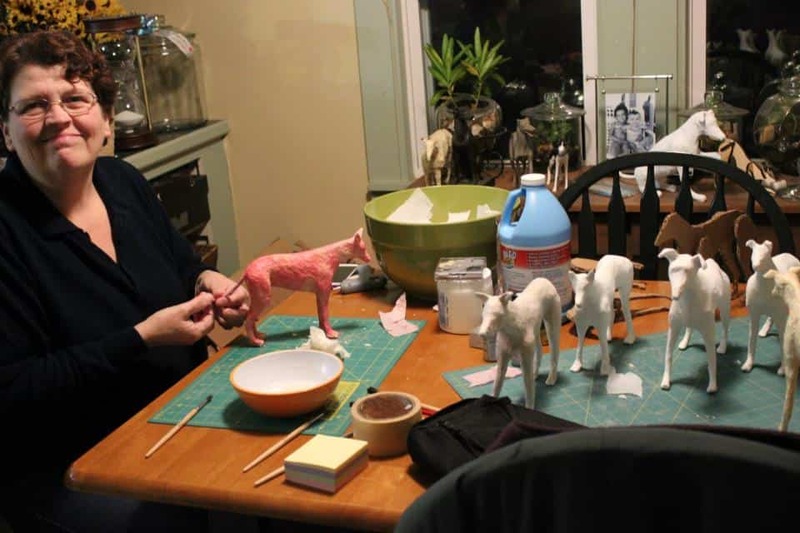 We had a small team working on them between cutting them out, sculpting, applying the paper mache and making custom beaded collars for each one. I then recruited artists from around the country to paint and embellish them. They are as far away as San Diego and Florida. I knew you would want to see Terri’s paper mache greyhounds and learn about the auction, so I asked her if she’d like to do a guest post. She replied right away with the information and photos above, but my computer was turned off … I was busy tearing out plaster and ripping down fake wood paneling in my house – that’s my excuse. That meant that I missed the deadline, and Terri’s post didn’t go up in time for the auction, which happened on February 10. They called the event the Valentine Nine Paper Mache Greyhound Auction. 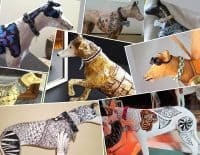 Of course, as soon as I got back on my computer and found Terri’s email, I asked her if I could still post her article so you could still see her paper mache greyhounds, and she graciously agreed. We were raising money for Cupid’s surgery bills. 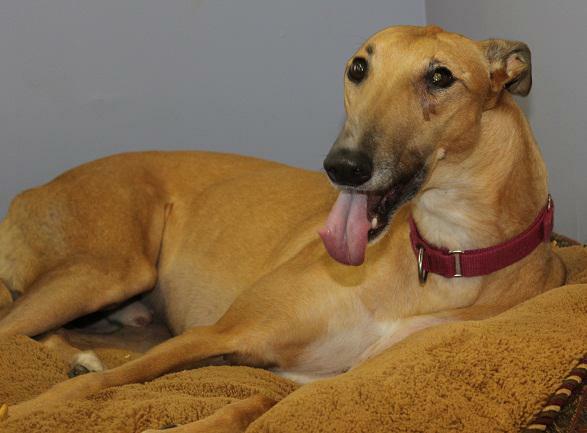 Cupid came to us needing immediate leg surgery for an injury he suffered during racing. 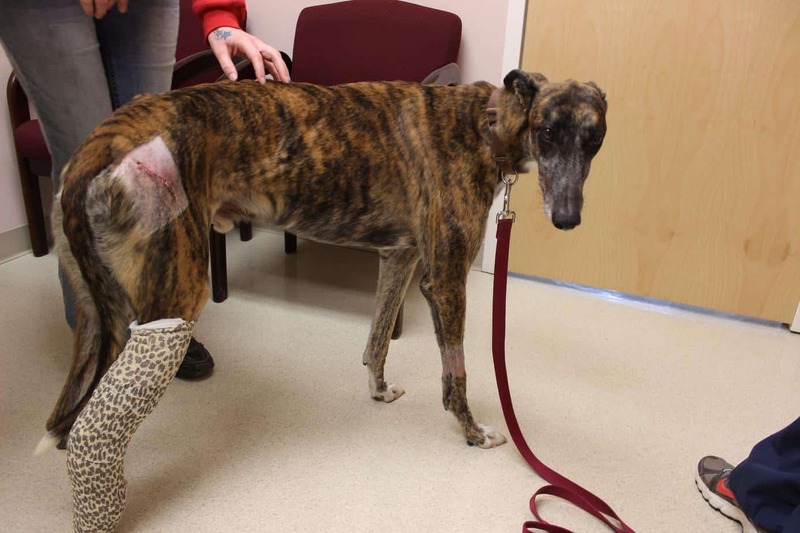 His doctor said it looked like his bone had exploded inside of his leg. 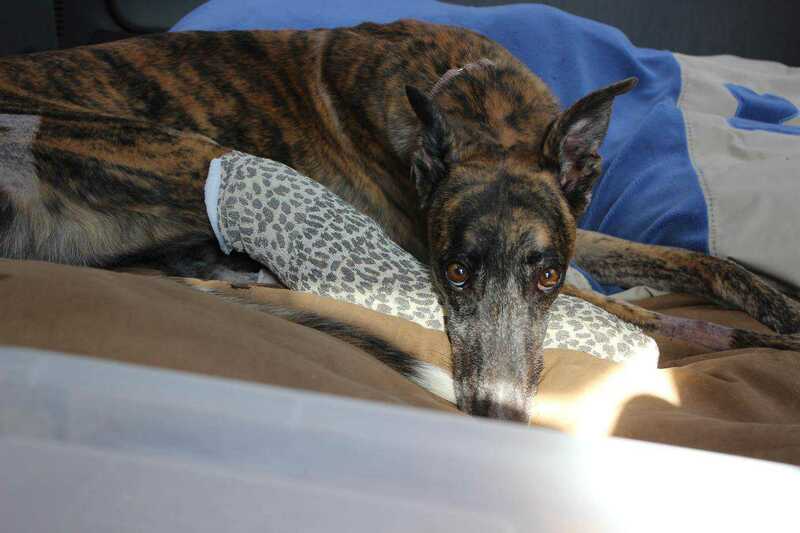 We raised $1,830 towards Cupid’s surgery which will cover a little over half. We were very surprised and happy by the results. 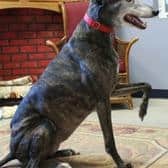 Here’s a link where you can learn more about Fast Friends Greyhound Rescue in Swanzey, New Hampshire. We have over 30 greyhounds in our care at any given time waiting for new forever homes. I’ve attached a picture of Caroline with the finished “micro” Moose. 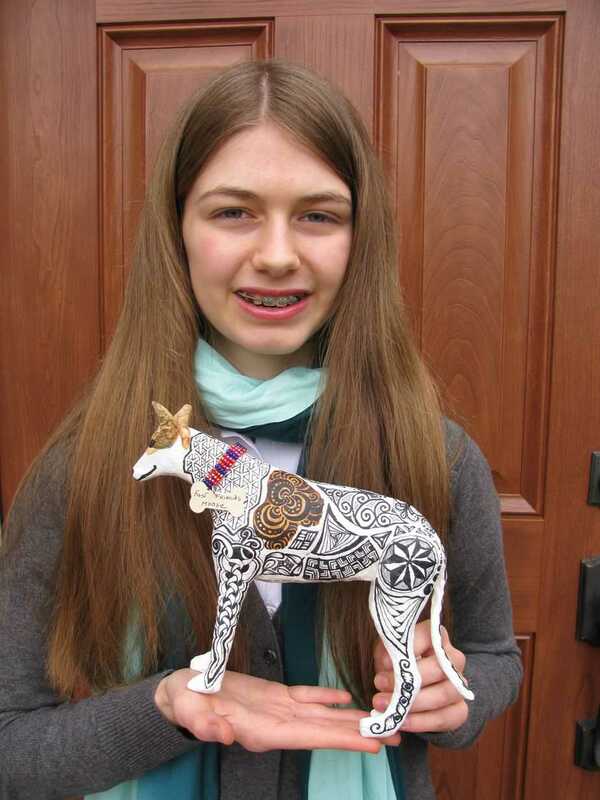 She and her mother Amy Broady decorated Moose. 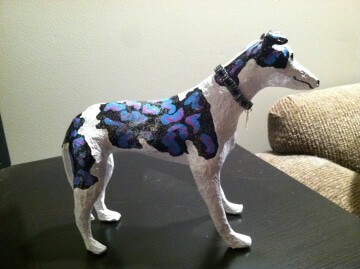 I am also working on putting together another auction for April which is Adopt a Greyhound Month. 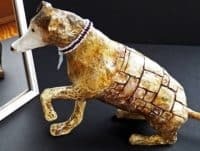 There will be 10 greyhounds in the April auction. They are all currently available for adoption. Thanks Jonni and have a greyt day! April is coming up soon, so watch their Facebook page to see the announcement. And good luck Terri – both your real greyhounds and your paper mache greyhounds are wonderful. I hope they all find new homes soon. 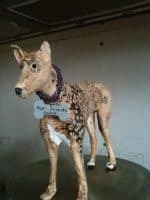 Could you please make a tutorial of how you made that dog with papier mache? I am brand new to paper macho. I made a figure which I think is pretty good for my very first attempt. 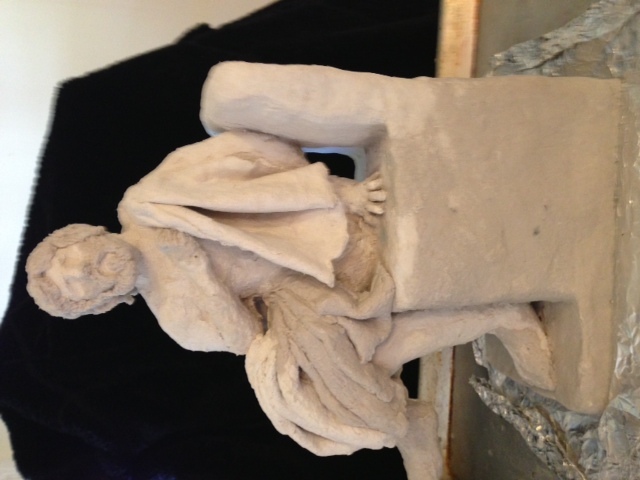 I used Celluclay. However, I noticed that it has some tiny bluish green spots and now a few black spots. could this be mold? What should I do for this piece and future pieces to prevent this if it is mold? Very nice!. But yes, those spots sound like mold. Some of my readers add salt, or clove oil, or even a small amount of bleach to their paste or paper mache clay recipe. The most important thing is to dry the finished piece as quickly as possible. You might be able to kill the fungi by painting the spots with diluted bleach. Any other suggestions, anyone? WOW!!! How awesome is that!?!?! And what a wonderful job they did!! I just love stories like this! Great work! Ah yes!! 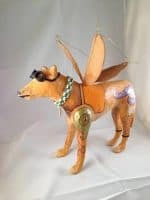 This is how I met that one artist I was telling you about, the one who decorated “Owen”, the steam-punkish winged greyhound. Michael Owens is her name. I can’t wait to see what Terry comes up with in April. What a really great concept. Stands out in the constant flood of fundraisers, and the collaborative aspect of it is super fun, too.